Almost three months back we had told you that Yahoo! would be most probably discontinuing two of it's popular web based services: MyBlogLog and Del.icio.us. Well, it has happened as Yahoo! has officially discontinued it's MyBlogLog service and we think Del.icio.us will follow soon (or may be not). [More] Four Awesome MyBlogLog alternatives for your blog. You have been identified as a customer of Yahoo! MyBlogLog. We will officially discontinue Yahoo! MyBlogLog effective May 24, 2011. Your agreement with Yahoo!, to the extent that it applies to the Yahoo! 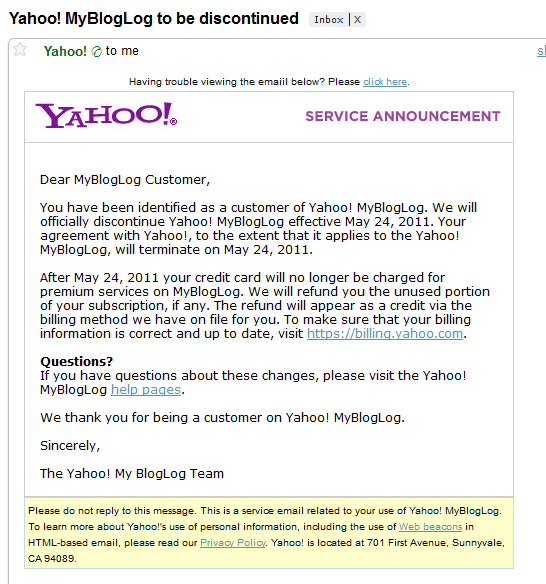 MyBlogLog, will terminate on May 24, 2011. Here is a screen shot of the e-mail which we received. You can read the contents of the e-mail here.